Designed with the professional bike shop in mind. 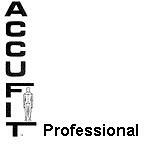 Accufit Professional will allow your employees to provide the very best Bike Fit possible to all of your customers. In addition, the database search capabilities will allow your customers to select the best fit from your inventory and provide setup data for the shop to insure correct fit at delivery. Find out why you should be selling FIT in your bike shop. A case for Accufit over other fitting systems. Want to find out what makes Accufit Professional different from other fitting systems? Take The Tour! True technology, not a lot of expensive hardware. Inexpensive Measuring device. The Accufit Caliper. Searches a custom database to find the best fit from your stock. Setup data for bike selected. Free 30 day product evaluation. For additional information about ACCUFIT Professional or to request a CD or Download URL, please complete and submit this form. Without a valid email address, I will be unable to send you the URL.